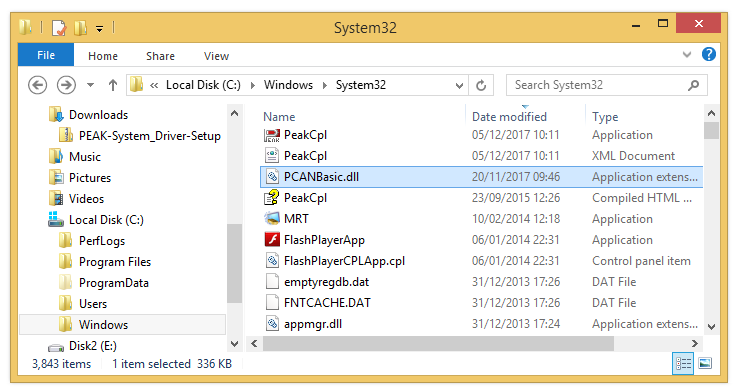 This article is a tutorial on accessing the PEAK-System PCAN-USB CAN interface from C# code. The PEAK-System PCAN-USB adapter is an established product that comes with drivers and example code. That code was the inspiration for a C# software library to allow for quick integration into a .NET project. A download of the library to interface to the PCAN-USB adaptor is provided, along with a demo program. The Controller Area Network (CAN) is a digital data bus used to transfer sensor readings and actuator values between computers and microcontrollers in many types of systems. It was invented by Bosch for use in cars but is now used in other transport systems, buildings and factory automation. 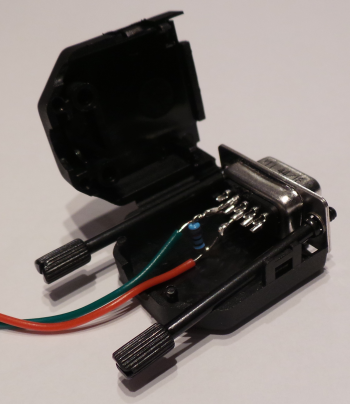 Its popularity is due to its simplicity (just two wires), lowcost and reliability. The data speed is low by todays standards, commonly up to one megabit per second (1 Mb/s). Five hundred kilo bits per second (500 kb/s) is often seen in vehicles. For long cable lengths low speeds are required (less than 125 kb/s). For links to detailed resources on the CAN protocol, and information on CAN bus wiring see the article CAN Bus Wiring Diagram, a Basics Tutorial. The PEAK-System hardware CAN interface, the software that PEAK provides, and the library provided here, means that a .NET app is easily connected to a CAN bus. Whilst lower cost USB to CAN interfaces are available, the support from PEAK and the performance of their products means they are widely used. The PCAN adaptor comes with a standard USB connection for attaching to a laptop or desktop computer. The connection to CAN is via a 9-way D-type plug. The pinouts match the common CiA 303-1 specification. See the CAN Bus Wiring Diagram article. Note, some single board computers and Arduino CAN adapters do not follow the usual CiA CAN wiring. If using the PEAK USB adapter on some of those devices, check the device information to ensure correct wiring. The PCAN-USB manual available from the PEAK-System support page contains information on the PCAN-USB D-type connector. For basic CAN operation the CAN high, pin 7, and CAN low, pin 2 are connected together. A CAN data bus requires a termination resistor at each end to absorb signal energy. This prevents the signal from reflecting back along the two wires an interfering with subsequent data transmissions. 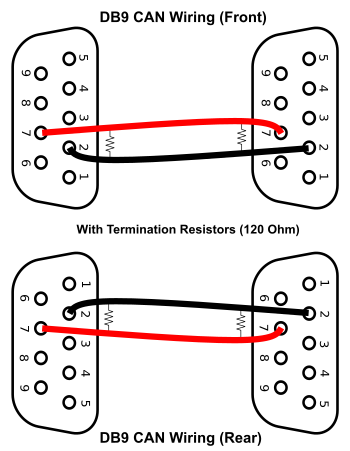 The termination resistance is typically 120 ohms. 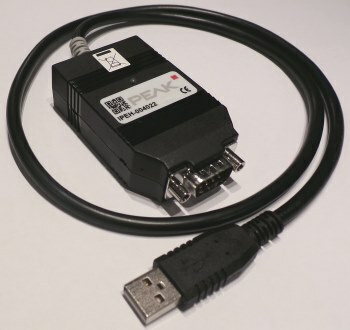 The PEAK-System PCAN-USB manual has details on enabling the termination internally in the PCAN-USB device. 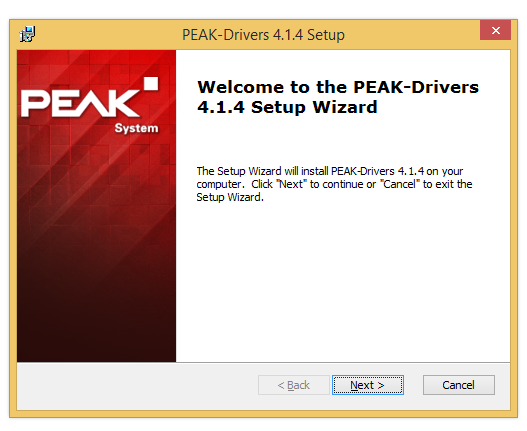 Windows drivers (installed by running PeakOemDrv.exe from the PEAK-System_Driver-Setup.zip download). A variety of Application Programming Interaces (APIs), in the form of Windows DLLs, are available (e.g. XCP, ISO-TP, UDS, etc.). The starting point (as used in the software provided here) is the PCAN-Basic API, accessed via PCANBasic.dll which can be installed with the drivers, or download the pcan-basic.zip. The Peak-System PCAN-USB sample for C# is a WinForms program. Therefore, it shows how to add PCAN-USB support to a C# project. To simplify the process a DLL project has been developed that can be dropped into a .NET solution. The PCAN-USB interface is then accessed via a C# class. This makes the PCAN-USB device immmediately available for use in a new project. Note: Please consider the software as beta. It is your responsibility ensure that the software will not cause you any issues. The C# class to interface with PCAN-USB is available from GitHub, in the project called PCAN_for_USB. If you don't want to clone the project (https://github.com/GR8DAN/PCAN_For_USB.git) then it can be downloaded from here as a zip file, or via the GitHub zip file link. Once the zip file is extracted, or the project cloned, the demo program can be tried. 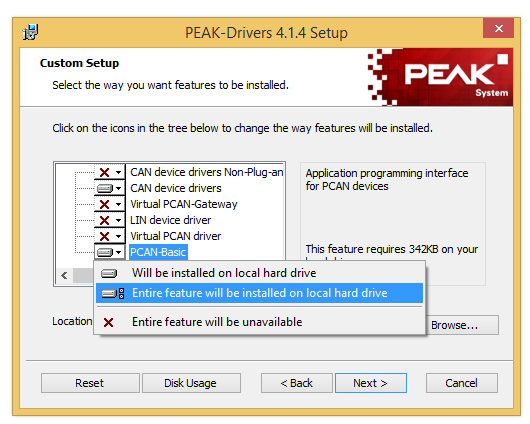 However, it will require the PEAK-System PCAN-USB drivers to be installed, along with the PCANBasic.dll (see above). Another CAN device will be required to form a CAN network. It you have two PCAN-USB devices they can be used to talk to each other. The Visual Studio solution file is PCAN_For_USB.sln. Open the solution, it should build and run when the Start/Run button is pressed. Select the PCAN-USB device from the list of detected devices. Select the correct or required baud rate. 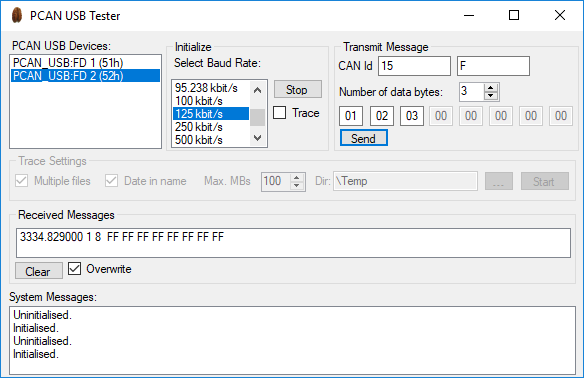 A standard eight byte message can be transmitted, and received messages are displayed. The code for the UI demo should be easy enough to understand, and helps to see how the PCAN_USB class is used. To reuse the PCAN_USB class add the project to a new solution (or add a reference to the compiled DLL). For example copy the PCAN_USB project to the new solution folder. (It is good practice to change the ProjectGuid.) In Microsoft Visual Studio add the PCAN_USB project to the solution using the Add and Existing Project menu options. Add the reference to PCAN_USB in the project that will using the PCAN_USB class. The PEAK-System API uses an unsigned short integer to reference a PCAN-USB device, use DecodePEAKHandle to extract it from the string displayed in the list. A list box can be updated automatically as packets are received. Note: This feature has not been optimized for performance. When finished with a PCAN-USB adaptor call Uninitialize().